According to a new market report published by Transparency Market Research titled “PoE Injectors Market, by Type (Single Port Midspan, Multi Port Midspan), by Application (Connectivity, Security & Access Control, Lighting Control, Infotainment, Others), by Installation (Indoor, Outdoor), by End-Use (Corporate Offices, Healthcare Facilities, Retail, Communication, Other Industrial Sectors, Residential)– Global Industry Analysis, Size, Share, Growth, Trends, and Forecast, 2018 – 2026,” the global PoE injectors market is expected to reach US$ 950 Mn by 2025, expanding at a CAGR of 9.5% from 2018 to 2026. North America held the dominant share in the PoE injectors market in 2017. Power over Ethernet (PoE) injectors allows Ethernet cables to simultaneously transmit power and data using a single network cable. This enables network installers and integrators to deploy powered devices in locations which lack electrical circuitry. PoE eliminates the expenses of installing additional electrical wiring. The common types of PoE utilization include VoIP phones, IP cameras, wireless access points, PoE lighting, ATM machines, IP intercoms, security card readers, IP clocks, and vending machines. Flexibility benefits such as compatibility to provide power source to any IP device is expected to drive the demand for PoE Injectors over the forecast period. Eliminating the need for installing separate electrical cables to provide power source is also a prominent factor for choosing PoE Injectors. The proliferation of Power over Ethernet connected devices has expanded the need for power above 30W for power sourcing equipment as specified under IEEE802.3at standard. To address high power requirement, the IEEE Committee has drafted the IEEE802.3bt standard which will allow power output up to 90W per port for heavy industrial/outdoor needs. For wide area IP surveillance deployments, PoE Extenders are being used to cover distances up to 500 m with single extender. The extender features plug & play installation and supports up to 1000/100/10 Mbps data transfer rates depending upon its type. In terms of type, multi-port midspan is expected to have highest CAGR as it has the capabilities of multi-ports, providing consumers different options to connect devices as and when required. Based on application, infotainment and lighting control are expected to register highest CAGRs as compared to others as increasing IoT adoption is expected to roll out innovative products running on PoE. The Asia Pacific region is expected to have the highest CAGR as compared to other regions, with the IoT industry witnessing growth potential from 2018-2026. PoE devices have the flexibility benefit of mounting the PoE injectors anywhere in buildings, such as near entryways or on ceilings. Modern PoE injectors are being designed to be deployed in devices where high bandwidth is demanded. The implications for powered Ethernet connection are numerous for end-users and network infrastructure. Using the same Unshielded Twisted Pair (UTP) cable for supplying both power and data simplifies the installation along with simplifying implementation cost, thereby increasing the demand for PoE Injectors over the forecast timeframe. By type, multi-port midspan has the highest growth opportunities as consumers prefer to choose multi-port midspans over single-port owing to the convenience of numerous installations from a single location. Multi-port midspan also has the advantage that if a PoE connection gets disabled, it can be connected to another port without replacing the injector. By end-use, the residential segment is expected to have the dominant growth rate as the injectors are being adopted for various residential purposes such as surveillance and infotainment. Retail and healthcare facilities are also expected to have high growth owing to introduction of newer IP devices and their installations. Majority of the applications of PoE injectors can be found indoors. In order to cater to the demand for outdoor connectivity, surveillance, and security & control, PoE injectors of higher power output are also being introduced in the market. 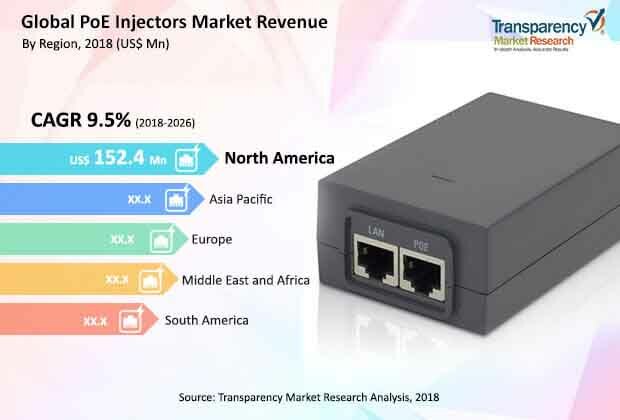 Outdoor building surveillance, connectivity, and lighting control are expected to be the major growth opportunities for the PoE injectors market over the forecast timeline. Companies are focusing on achieving long-term growth through innovations in the PoE injectors market. Some of the major competitors in the market include Advantech Co., Ltd., Phihong Technology Co., Ltd., Linear Technology Corp., American Power Conversion Corporation (A.P.C.) B.V., Cisco Systems, Inc., Microsemi Corp., L-com, Inc., Sixnet Holding LLC, ICP DAS Co, Ltd. and TP-Link Technologies Co., Ltd.